Prince George’s County residents may dispose of storm-related debris free of charge through Friday, July 6, 2012 at the Brown Station Road Sanitary Landfill and the Prince George’s County Yard Waste Composting Facility. Both the Landfill and the Composting Facility will be closed on Wednesday, July 4, 2012 in observance of Independence Day. Residents may dispose of brush, tree limbs and other storm-related debris such as roofing materials, siding and damaged household items at the Brown Station Road Sanitary Landfill, located at 11611 White House Road in Upper Marlboro, between the hours of 7:30 a.m. and 3:30 p.m. The Prince George’s County Yard Waste Composting Facility, located at 6601 E. Crain Highway in Upper Marlboro (from Crain Highway, proceed on Maude Savoy Brown Road and follow signs to the facility), will be open for residents to dispose of brush and tree limbs only from 7 a.m. to 3:30 p.m.
Verification of County residency will be required upon entering the Brown Station Road Sanitary Landfill and the Prince George’s County Yard Waste Composting Facility. Commercial vehicles will be charged according to the normal disposal rates. Years of complaints from area residents about frequent power outages— seemingly during almost every storm—may have finally brought results. 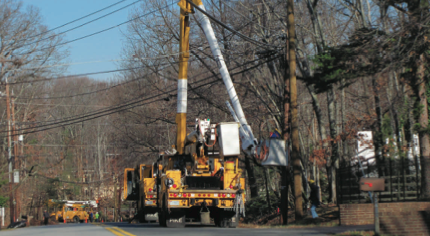 “We completed the work on some of the lines in December 2011, which involved the replacement of 19,524 feet of primary wire, 8,637 feet of secondary wire, 7,888 feet of neutral wire, 25 poles, 8 transformers and tree trimming,” Hainey wrote in a message to Piscataway Hills News. “We also replaced underground cable in two subdivisions recently; Piscataway Estates and Warburton Manor,” Hainey added. In response to concerns that non-emergency police calls were not being answered , a top county official told PHCA members that improvementswere in the works. Charlynn Flaherty, Associate Director for Public Safety Communications, the featured speaker at the PHCA fall quarterly meeting on Sept. 20, explained that the county emergency call center handles all 911 calls, including police, medical, and fire emergencies. The office also handles burglar alarm calls. An average of 13 people on duty at all times handle a total of 1.6 million calls per year, she said. Non-emergency callers should use 301-352-1200 or call Police District IV directly at 301-749-4901, Flaherty said. Outgoing PHCA President John Schnizlein said he had called the police non-emergency number to report an illegal trash dumper on Piscataway Drive but got no response. Flaherty replied that the average wait for a non-emergency call is 7-10 minutes, but that improvements were being planned by a new Public Safety Technology Working Group. Ideas under discussion include the use of social media, public safety databases, and a 311 public service line.